You don’t have to flip too many channels or look at Facebook for very long to realize we’re a divided nation. 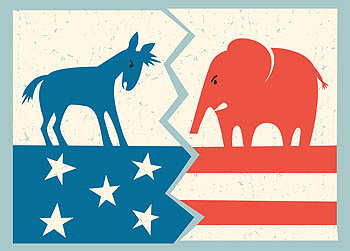 If volatility had a colloquial definition, it would likely include a divisive presidential election between two polarizing candidates who are miles apart on every issue. The Election of 2016 has been toxic and has left its mark on the American psyche. There has been a surge in reports of insomnia, anxiety, depression and even chest pains leading up to Election Day. An entire new industry has arisen solely devoted to combatting election stress, polling anxiety and voting day angst. The ‘political left’ has dubbed Donald Trump the embodiment of racism, chauvinism, hatred and white privilege. The ‘political right’ has labeled Hillary Clinton as corrupt, entitled, self-serving and a quintessential Washington insider. Clinton’s favorite talking points include social justice, gun control, expanding Obamacare, racial and ethnic equality and the climate change debate. Trump’s campaign has focused on securing the border, preserving the Second Amendment, repealing Obamacare, cutting taxes and reducing regulations. “East is East and West is West, and never the twain shall meet.” This well-known line from Rudyard Kipling’s The Ballad of East and West aptly describes America’s current political divide. But when all of the speeches have faded and the final ballots have been counted, the next President will be left with an economy that continues to stumble despite the massive government spending, aggressive bond buying and colossal bailouts that have pushed our sovereign debt to just under $20 trillion. While the October job numbers were touted as progress, part-time and underemployed workers are not reflected in the top line figures. Long-term unemployment actually saw no improvement and the labor participation rate remains historically low - and actually lost ground. There are still 95 million people not in the labor force, 14 million more than when President Obama took office. And, despite Q3 recording modest progress, GDP for 2016 is currently on track to record the weakest growth since 2009 raising the spectre of recession. So no matter who wins the election, an economic conundrum will be waiting. If Hillary Clinton prevails, entitlement spending will soar and job creators will face higher taxes. If Donald Trump is victorious, it will be a shock to the political system and the jolt of uncertainty will likely send global markets reeling. With an extremely close election on tap and partisanship running high on both sides of the aisle, gold is a critical crisis hedge and a solid store of value for anyone looking to protect their savings and retirement accounts. Call us at (800) 289-2646 to get protected today.